By my count, Simmons passes up roughly 75 miles of open shooting space in this 17-second video, twice opting to try to ram himself into the clogged paint instead of taking a wide-open, uncontested jumpshot. (Fultz, for his part, kicks things off by passing up a reasonably open stationary look to dribble into a much worse off-balance one, with plenty of time left on the shot clock.) Predictably, this leads to a three-second lane violation, as Simmons’s unwillingness to shoot leaves Joel Embiid stranded in the lane after he positions himself for an offensive rebound. This is just one possession, in a game Simmons shot a gruesome 5-for-20 from the floor but which the 76ers nevertheless won; it doesn’t have to mean much of anything. To accompany it, though, here are some suitably bone-chilling basketball statistics. Through four games and change (he sat out against the Pistons on Oct. 23 and logged only seven minutes against the Magic a few nights earlier), Simmons is posting a 45.1 True Shooting percentage; according to Basketball Reference, that’s the 227th-highest TS among the 266 NBA players who qualify for the minutes-per-game leaderboard. Simmons’s (ghastly!) 41.7 effective field goal percentage, meanwhile, ranks 228th. And here’s a wild kicker: That eFG number is identical to Simmons’s basic field-goal percentage, because he hasn’t attempted even a single three-pointer yet. Boban frickin’ Marjanovic has tried more treys than the Sixers’ point guard. That’s bad! Philly surpassed 50 wins and advanced a round in the playoffs last season, and Simmons won the Rookie of the Year award, despite him all but totally refusing to attempt perimeter jumpshots—he shot and missed a single three-pointer in 2017-18, and took only a handful of long twos. So maybe your inclination is to shrug at these numbers. (You could also rightly note that the sample size remains relatively tiny.) But these are way worse than last season, when Simmons posted respectable TS (55.7) and eFG (54.1) figures. It was always inevitable that, if he didn’t get at least willing to huck up the occasional jumper, sooner or later opposing defenses would figure out how to make something of this imbalance in his game. In the numbers, there are reasons to think this may be happening. Simmons’s 98.0 offensive rating is the second-worst on the Sixers (ahead of some guy named Jonah Bolden who has played four total minutes) and the 310th-highest in the NBA. On/off-court stats are noisy, especially this early in the season, but surely it points to nothing especially good that when Simmons takes to the bench, Philly’s team offensive rating leaps more than 16 points, to 114.7, good enough to rank in the top five NBA offenses. The Sixers’ two most-used five-man lineups—the starters, and then the starters with J.J. Redick in place of Fultz—are posting offensive ratings (97.6 and 100.0, respectively) that, if they were the team’s overall offensive rating, would rank 30th and 29th in the league. 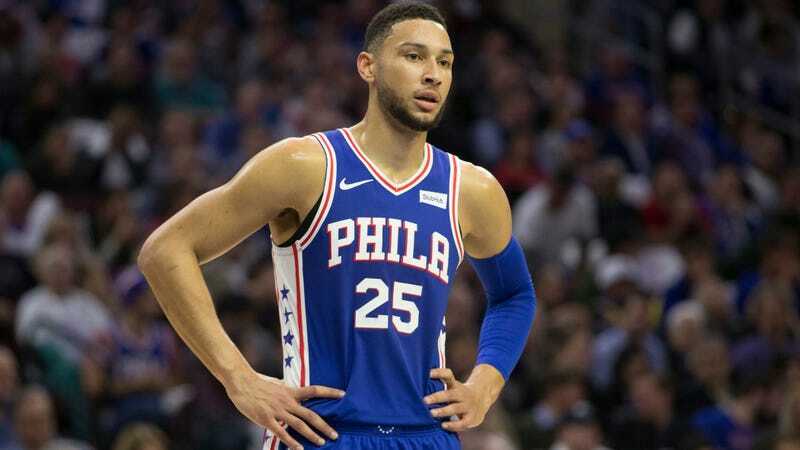 In any event, math partially set aside, what appears to be happening more and more frequently is: Defenders don’t bother coming within a mile of Simmons when he has the ball on the perimeter, and when he forces his way inside despite all that shooting space, more of them have figured out to stay at home, keep their feet on the ground and their hands up, and wait to see what he does. It’s a version of how teams have defended the infamously shot-averse Rajon Rondo over the past decade, as he went from an All-NBA player to a cranky itinerant sinkhole. In Simmons’s case his defender can’t quite completely ignore him to act as a roving free-safety, because the very large Simmons is a threat to control the offensive glass and sky for alley-oops if nobody at least keeps an eye on him, but the principle is the same. When Simmons throws entry passes to Embiid, his defender gets there to double-team before the ball arrives. This is not ideal. Sharing the floor so much with Fultz doesn’t help, of course—but that putrid 100.0 offensive rating with one of the NBA’s best shooters (Redick) subbed in at shooting guard makes it clear this isn’t only, or maybe even primarily, about Fultz’s problems. Simmons is a bit of a stubborn control-freak, like so many of the game’s greats; he has largely willed his way to being a credible 6-foot-10 point guard in a three-crazed NBA despite a total unwillingness to shoot from outside, and that’s amazing and wonderfully preposterous. This radical insistence on staying within his comfort zone hasn’t prevented Simmons from becoming one of the best young players in the league and turning the Sixers into a very good team. But if they’re going to go farther than that and become the sort of team with a shot at reaching the Finals every year, they’ll need their young players to adjust and grow into themselves just as the rest of the league adjusts to them, or ideally even faster than that. There’s only so much anybody, even someone as talented and stubborn and controlling as Simmons, can do to counter defensive adjustments in 2018 without a reliable—or demonstrably existent—jumpshot. Eventually, and probably sooner than he’d like, he may have to start putting them up, and see what happens.